Arizona-based membership software company, Socious, unveils new tools to help association professionals and community managers make more informed decisions about steering and growing their communities. Member engagement is one of those buzzwords that everyone is excited about and wants to increase, but often has a hard time measuring. These new features will go a long way in solving that problem for our customers. Mesa, AZ: Socious, a leading provider of membership management and community software, announced the release of new features that allow their customers to more easily track member engagement in their MemberCloud membership and online community platforms. These two features, the Engagement Dashboard and Metrics Bar, provide customers with a high level overview of many of the top tasks that members perform and give them insight into what their members care about. Socious’s innovative approach gives associations, companies, and user groups the ability measure and track member engagement like never before. The Member Engagement Dashboard gives Socious clients a series of easy-to-view graphs on a single page. It provides the crucial information organizations need to determine their members’ engagement level, as well as the type of content that they enjoy. Visual representations of data in graphs make engagement levels easy to understand in less time. For those who want in-depth, exact data, simply mouse over points on the graph to see the number of members who completed that activity at that point in time. 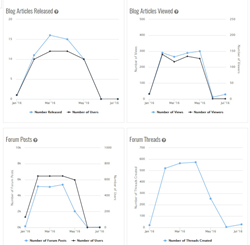 Socious also released its new Metrics Bar feature this month. This snapshot allows membership professionals and community managers to easily monitor numerous member engagement metrics, including login information, forum participation, and the amount each member has spent with the organization over their lifetime. Socious found that many associations and other member-based organizations are focused on increasing their members’ participation with their organizations. Socious is meeting these organizations’ needs by developing tools centered around measuring their members’ engagement levels. Since associations are able to get a high-level overview of their members’ participation levels, how they’re participating, and the areas where members are not engaged, organizations are better able to meet their members’ needs while increasing engagement at the same time.